Want results like this? Learn more about our BLM and LSO packages. The Holiday Inn Express & Suites in Council Bluffs, Iowa is one of the many hotels located in the city. When they started with us, they were in the 24th position on Google under “Hotel in Council Bluffs”. According to Google’s keyword tool, approximately 5,400 people search for “Hotel in Council Bluff Iowa” a month. The 3rd page placement in the Google search results averages less than 0.1% of searchers visiting their website, amounting to about two online visitors per month for that key term. The improvements needed were clear. The Holiday Inn’s poor pagerank resulted in minimal website traffic and, in turn, fewer potential guests for their hotel. On October 24, 2012, the Holiday Inn Express & Suites signed up for our business listings management. 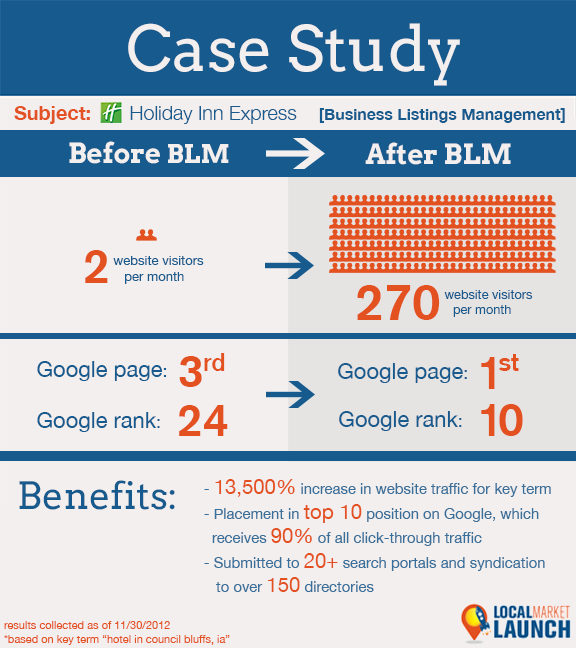 While there are many hotels in the area, the majority of them have done very little search optimization, so we felt that BLM would really enhance their online visibility. 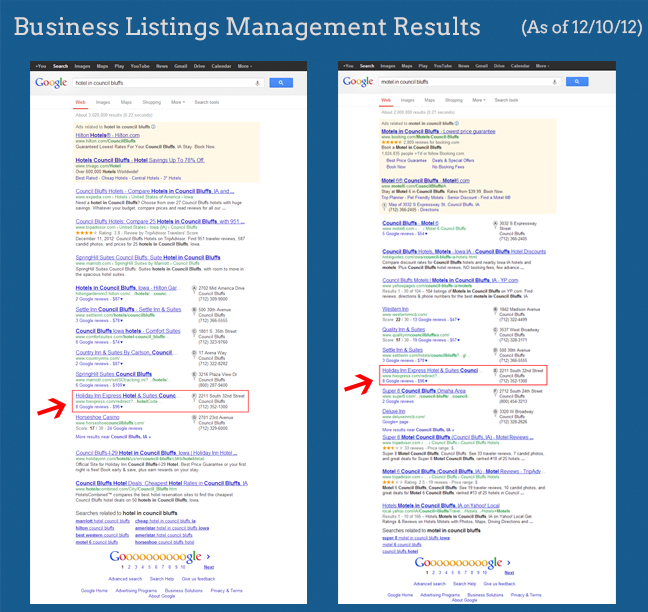 As of December 10, 2012, the Holiday Inn Express & Suites can be found much higher in many search results than when they started with us. One such example is for the keyword phrase mentioned above, “Hotel in Council Bluffs.” Previously, the hotel was ranked 24th for this term, resulting in an average of two visitors per month. Just 3 weeks later, they are now in position ten, resulting in a 13,500% increase and an extra 270 website visitors every thirty days. According to a recent ComScore study, 82% of these visitors will become potential customers, meaning that the Holiday Inn has gained 220 potential customers from that single search term. While such a significant outcome is not always this immediate, the results of Holiday Inn in Council Bluffs illustrate the potential online presence our services can build for your hospitality firm. Take a look at our plans and packages and get started today!